Below are Amstrad CPC and PCW computers we recover model numbers we see, however just contact us if your floppy discs are not listed. Every disk is photographed and a copy provided with the extract data. This is useful as it often captures handwritten notes on the floppy disk which help identify it's contents. As you may know the Amstrad Filesystem only allowed DOS style 8+3 character names so sometimes the hand written notes on the disk were useful. If the disk is placed straight into a drive after years of storage, our experience has shown that the heads will dig into the surface contamination (that will have grown on it due to age/humidity etc) and rip up the surface. Therefore the disk undergoes a cleaning procedure to remove this surface growth before being inserted in any drive. 3.1 It moves the head smoothly in one direction from start to finish of the disk. 3.2 Our system can identify bad/poor sectors on the first pass, and go back and target only those bad sectors on subsequent passes until they read ok. In this way we can build up a perfect disk image, or at least provide an audit trail of bad sector numbers. We then only perform file extraction from the disk image, each disk has it's files stored in a separate folder. Where File Timestamps and Metadata exist they will be preserved. Almost every disk we have seen has had it's files written in Locoscript - we provide conversion to MS Word and Excel. 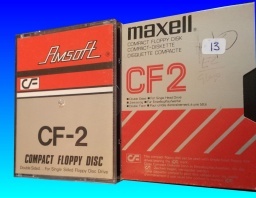 Amsoft and Maxell CF2 discs are the most common types we receive here for file conversion and transfer for editing on Microsoft Word, Apple Mac or Windows PC Computers. The discs are 3 inch wide contained in a hard plastic case, and usually the data survives quite well even today. Customers mostly have book manuscripts, novels, poems, text,diaries, address books, spreadsheets, program files written in Locoscript that they wish to convert for editing on modern Windows 7, 8 10 or Apple Mac OSX. The floppy disks were used by Amstrad Word Processors CPC6128 CPC464 Plus (CPC+), PCW8256 8512 9512 9256 and Sinclair Spectrum +3. Schneider and Panasonic EBF-CF2 also made 3 inch floppy disks, but we have yet to see one! We can extract all the raw data from the disk to create a disk image (disk cloning or sector by sector copy of the disk's data) or so called dd file, from which we can recover data that others can't. Disk clone copies every readable part of the disk, so even if a filesystem can't be read, or the disk is complaining of format errors, or that it is not formatted, we can usually manually retrieve all available text / documents from the disk for you to re edit at your leisure. If you have a request then simply contact us. When a disk is complaining of being unformatted, not being recognised by the system when inserted, not being read properly, and preventing access to the crucial file you want, then you likely require data recovery techniques to extract all the available data to remake the file. 3 inch floppy disk drives are not common, and their interface to something useful to be able to copy past the corrupt filesystem is not readily available. Fortunately we have specialised data recovery hardware for the CF2 3 inch disks. 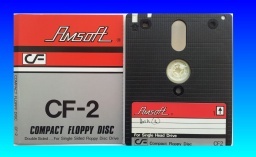 We can copy the CF2 floppy disks from Amstrad CPC and Amstrad PCW and provide a disk image - ie. a copy of the raw data or in most cases extract the actual files as well. While some of the data may be a bit fragmented, it is fortunate these disks only hold a small amount of data and it is quite possible to piece together the original file text if the end user remembers roughly what it was about. In this way we have saved many a writer's document / masterpiece even when other companies say it is not possible to recover the file. 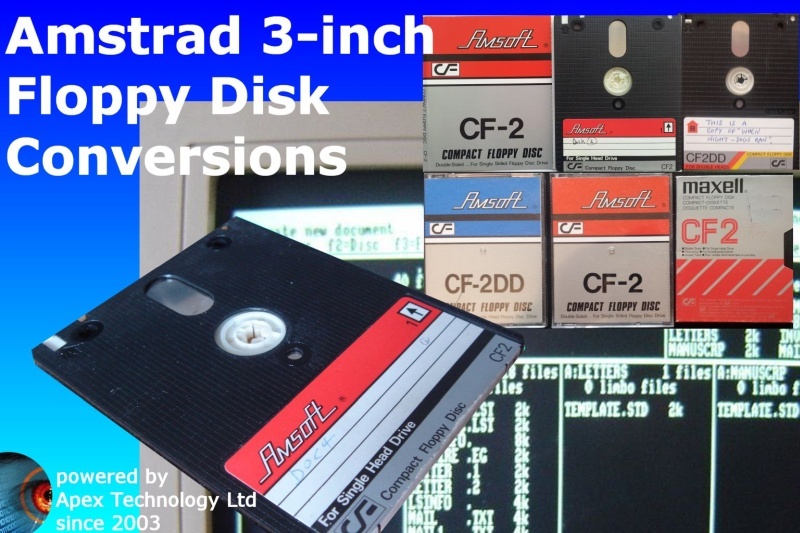 While less popular than their 3.5inch counterpart, the 3 inch CF-2 Compact floppy disc was used by Amstrad (Amsoft) and Sinclair. They consist of a flexible magnetic coated disk inside a square or rectangular plastic case. The discs held 180K or 720K of data and were formatted using CP/M file system developed by Digital Research. The 180k disks were flippy disks as you could use both sides, but in single headed drive meant you flip it over to use the reverse side. Amstrad / Sinclair 3 inch floppy disks as used on PCW8256 PCW8512 PCW9256 PCW9512 & CPC-6128 Plus, CPC-464 Plus. Amstrad also used 5.25 inch floppy disks eg.PC1512 Sinclair PC500, PC5120 PC6400 PC1512SD PC1512DD PC1640 PC1640DD HD20 HD30 HD10 The main software was Locoscript for word processing. The main types we see here are the Maxell CF2, Maxell CF2-D, Amsoft CF-2. 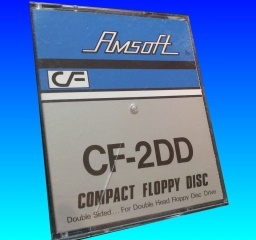 The Amsoft CF-2DD is a rare beast - marketed for the double sided drive but Amstrad did admit this was a marketing ploy to sell what was basically a CF2 disk at a higher price for double headed drives. A selection of disk conversion requests are below. Maxell and Amsoft Amstrad CF2 CF2D disks containing data that we have no way of accessing. 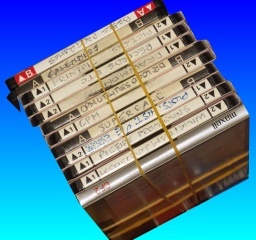 How do I read Amstrad LocoScript discs old formats on a new Mac? Converting the 3 inch floppy disks to say microsoft word. Convert 3 inch disks for Editing Locoscript files on a windows PC or Apple Mac OSX. Do you convert Amstrad files old books, writing, student notes, literature, thesis, University dissertation, or an old play or book manuscripts? I had an Amstrad with Locoscript installed for word processing and require conversion of old floppies. I used LocoScript on an Amstrad machine with a floppy disc. I need a file version that could be printed on a modern printer. My floppy disc reader connects to my iMac but it won’t accept Amstrad discs. How do I go about retrieving Data From Old Amstrad Floppies? I am trying to retrieve data from some older floppy discs. Disk not formatted when trying to access it. Amstrad 3 inch floppy disks PCW 8256 9512 8512 9256, CPC 6128 464 Plus file transfer and conversion problems that we recover data from are listed below. Amstrad Floppy Disks PCW CPC Files Conversion Transfer,8256,9512,8512,9256,6128,464+Plus,Word Processor,Joyce,Amsoft,CF2,3 inch,Schneider,Locoscript,Maxell,Edit.